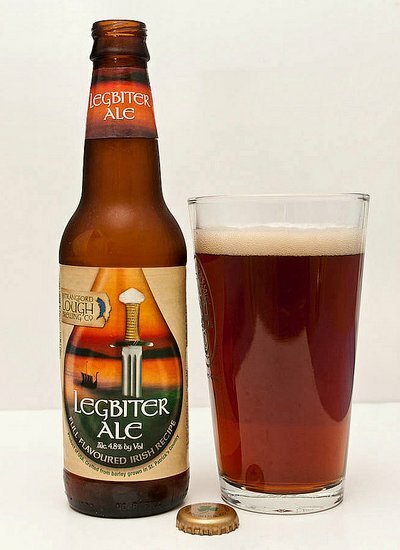 Legbiter is named after King Magnus’ sword. On the day of his death Magnus is described as “regaled with a helmet on his head, a red shield in which was a gilded Lion and girt with the sword Legbiter”. Legbiter’s hilt was tooth (ivory) and the hand grip wound about with gold thread and was extremely sharp! 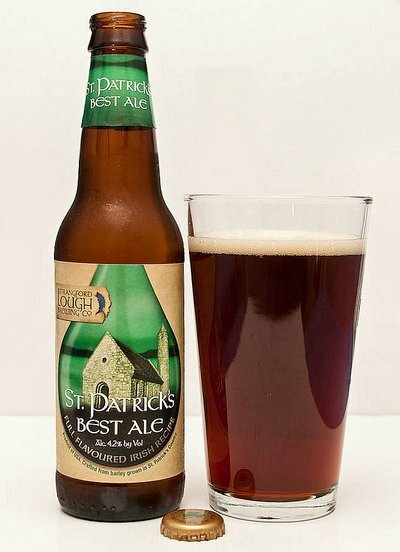 Strangford Lough Brewing Company has a range of Irish beers associated with County Down characters such as Magnus Barelegs the Viking King - buried in Downpatrick less than two miles from Saint Patrick, another of the company’s brands. St. Patrick, Magonus Sucatus Patricius, the son of the Roman Decurion Calpernius, was reputedly born in modern day Wales. Captured by ‘Nial of the Nine Hostages’ in the early 5th century, he was sold as a slave to the Irish Chieftian Milchu at Slemish, County Antrim. Escaping Ireland after six years he returned bringing Christianity. St. Patrick set sail for Ireland in 432AD, landing initially at Inver Dee, Co Wicklow and then in Strangford Lough at the village of Raholp. He converted the local chieftian Dichu to Christianity, building his first church at Saul. Returning to Slemish, the scene of his captivity, he made Armagh the primacy of the Christian Church in Ireland. St. Patrick’s missionary work covered the northern part of Ireland where Christianity had not penetrated. At Slane he converted King Laogaire to Christianity and at Croaghpatrick in Mayo he is alleged to have driven the snakes out of Ireland. He died at Raholp on 17th March 461AD and is buried on the ‘Hill of Down’, Downpatrick. Set amidst the spectacular Mountains of Mourne, Whitewater Brewery is Northern Ireland’s largest microbrewery and has been steadily ticking along since 1996, making it one of the first Irish craft breweries. The brewery was called one of the best in the world in the prestigious International Beer Challenge 2007 and their beers have won many awards over the years, including their Clotworthy Dobbin and Belfast Lager being named as one of the 50 best beers in the world in the International Beer Challenge 2007 and 2008, respectively. ​They produce a selection of cask beers, a lager in keg and many bottled beers, all of which are handcrafted in small batches. The brewery also has its own gastropub, the White Horse Inn, located 5 miles from the brewery in Saintfield. Tours of the brewery are possible but must be booked in advance. Check the website for a listing of where to find their beer in bottles, kegs and casks in Northern Ireland, which are widely available there. The beers are also available in the Republic, including in Tesco. Lager is the most popular beer style in the world by far, accounting for 90% of all beer consumption. Yet most of that is big brand lager, which is only a bland, sad shadow of what a proper lager should be. True lagers are dry and crisp, with a distinctive hop bitterness and a character that comes from the use of malted barley rather than corn or rice. 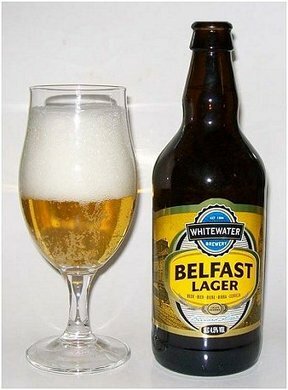 Whitewater’s Belfast Lager pours a pale, hazy straw yellow from the bottle and is quite yeasty and bready, both in terms of the aroma and the flavour. The first whiff is reminiscent of bread dough with a little lemony citrus note behind that, while Saaz hops give it a peppery bite. At 4.5% ABV, it’s a sessionable beer that would be perfect for a BBQ. If you’re looking for a good all-round summertime beer, it’s got to be a lager. Crisp & full flavoured, this continental style premium lager is brewed with the finest Saaz hops, rich in aroma and taste. Top 50 Beers in the World in category, 2008.